Discussing innovations in cruise ship retail are Adrian Pittaway, Corporate Head of Retail for MSC Cruise; Nadine Heubel, CEO of Heinemannn Americas; William Butler, VP Retail Services at Carnival Cruise Lines; Rene Riedi, Divisional Chief Executive Officer Central and South America for Dufry and Ron Goncalves, Starboard Cruise Services VP, Retail Performance & Operations. The session was moderated by Bill Panoff, president of PPI Group and Editor-in-Chief of Porthole Cruise magazine. A standing room only crowd of cruise, travel retail and supplier industry members packed into an information-jammed Cruise Innovation session held during the 2019 SeaTrade Global in Miami Beach on Wednesday. The session featured a panel of prominent industry officials who play key roles in the retail component of the cruise ships they work with: Adrian Pittaway, Corporate Head of Retail for MSC Cruises (with 16 ships in fleet and 13 in the pipeline for a total of 29 by 2027); Nadine Heubel, CEO of Heinemannn Americas, (the retail partner onboard 4 Carnival ships home-ported in Florida and Australia); William Butler, VP Retail Services at Carnival Cruise Lines (largest cruise line with 26 vessels positioned in 16 ports worldwide serving more than 5 million guests a year); Rene Riedi, Divisional Chief Executive Officer Central and South America for Dufry (which handled the retail concession onboard 32ships as of 2018) and Ron Goncalves, Starboard Cruise Services VP, Retail Performance & Operations (operating on more than 70 cruise ships). The session was moderated by Bill Panoff, president of PPI Group and Editor-in-Chief of Porthole Cruise magazine. Panoff kicked off the session, which was entitled, Duty Free for the future: What’s in store with the onboard retail revolution? focusing on innovation in the retail part of the cruise business, with a question about whether the cruise industry is ready for the millennial market. MSC’s Pittaway described his European-based cruise line as a “disruptor” which has brought a lot of new passengers and ideas to the region in the few years it has been in Miami. MSC recently announced a luxury division and has opened a private island called Ocean Cay in the Bahamas. Its ship, the MSC Grandiosa, has the largest retail footprint at sea with 13,000 square feet. Heinemann’s Heubel agrees that appealing to the demographic is all about experience and ethics but she also stressed personalization. “Getting something individualized is a great opportunity for us to create experiences. The product is one aspect but how to buy the product is very important as well. If we create a memory about buying the product it becomes part of the experience,” said Heubel. Carnival’s Butler says it is important to keep a balance between the technological advances like Carnival’s app onboard the ship (which communicates what is taking place and is personalized for each guest) and making sure that when the guests come into the store there is something there for them to be excited about. Dufry’s Riedi points out that millennials are looking for experience and value. In addition, they depend on their technology and demand service for their personal devices with accessibility to the internet and the cruise lines must provide this. 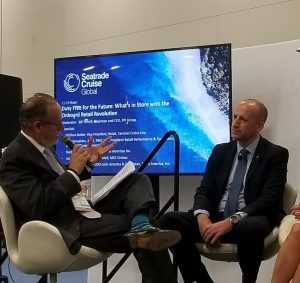 Starboard’s Goncalves, whose industry leading company handles a very diverse cruise base, noted that Starboard is following the lead of its cruise partners as it pertains to technology. “Quite honestly, the guest relationships begin with the cruise line and if we are not supporting them and not fully integrated into their process, we don’t have much of a chance of capturing that retail customer. This is particularly true with the millennials who strongly value that instore experience and those touchpoints that we have been delivering to a lot of these cruise lines. “What is key for us is looking beyond, to generation Z, who are going to show those propensities towards mobile even more amplified than the millennials. They are also looking for the experiential, the touchpoint, social responsibility and community,” said Goncalves. Panoff zeroed in on the use of mobile phones at sea: “As Rene already touched on, how are personal devices being utilized at sea for better shopping?” he asked. William Butler commented: “As we have built our app over time at Carnival, part of that process is understanding what is important for our guests onboard. When the guest downloads the Carnival app and sees all of the events going on, shopping is very much a part of that. How we emulate that is very important for us and we work with our partners to help us create what that script looks like— from there, if the guest wants to understand more, we provide information. If they want to learn about the beauty and fragrance products, for example, we can add a link about those products. We link to events and products and working in tandem with our partners, this is what has allowed us to be so successful with our current app,” says Butler. Heubel sees the Carnival app as a facilitator that allows the guest to know what is going on but she says it is very important to continue to develop the personal relationship with the passengers. “We should get the guest into the store via the app, but then have a very strong personal relationship with them in store to create the experience,” she stressed. “If you want to talk about innovation you have come to the right people,” adds Pittaway. “MSC pioneered Smart ships back in 2017 with the MSC for Me app. This has allowed us to connect the guest not only with shopping but it also inter-connects the guests, the crew and the ship, and has allowed us to connect holistically with the whole experience onboard. And now on the Bellissima we have Zoe, which is our in cabin virtual cruise assistant on video with the ability to talk to passengers seamlessly, not only about shopping but about whatever is relevant to the passenger. Zoe provides instant information and help in booking shows, spas and excursions. Zoe speaks seven languages, adapting to each guest’s profile and preferences. We want it to be frictionless. “But on the other hand, we are the anti-amazon, the way that we work. Guests are using mobile to accentuate the experience but the tech will not replace the human element,” he noted, and brought in China as an example. Mobile is also important for Starboard. “Using mobile is part of the journey and a way to experience and to understand and to learn before you get to the point of purchase,” said Butler. Butler also sees the app as an exploratory tool that can help educate the cruise guest. Dufry, which has such a large retail footprint outside of cruises, is a service provider, says Riedi, and follows the lead of its cruise operator. “They provide the technology and we see how we can best use it. In the retail channels that we operate outside of the cruise, we have our own technology including Reserve & Collect pre-order system. We also use push messages,” he explained. Technology can also play an important part in bringing brands to life onboard, said Panoff, asking how the panelists integrated this into the guest experience. Panelists cited the recent Bulgari Jewelry Fashion show held onboard the Costa Venezia, a Starboard project, as an example. At Dufry, Riedi says that he “truly believes in the trinity,” with the vendors, the cruise operators and the retailers working together. “You must bring all three partners to the table to create one common factor to serve the guests,” he said. Through its other travel retail businesses, Heinemann has access to many interesting brands that could be introduced onboard the cruise ships. Heubel says that it is up to us to “educate our brands to the opportunities of cruise and make sure that the brands under-stand this potential, in order to get more of these brands not currently in the channel.” She sees good potential with adding new brands to the mix. Analytics are certainly enhanced by technology, and the panelists use this tool to improve the retail offer onboard in a variety of ways. MSC’s Pittaway says analytics is imperative to the business: “MSC has more than 170 nationalities working on our cruise line – we are the most global cruise line — and each of these nationalities have different needs and requirements on how they operate the shops onboard. We must create an environment that is adaptable – whether we are in Brazil or in China, my ships have to be absolutely relevant to the passengers in the sector. “We are using analytics and the data we have to make the right decisions to have the right things in position, particularly in the newer ships,” he said. Carnival has “incredible” analytics, says Butler. “We have evolved quite a bit from a few years ago when we would place a stack of flyers in every cabin listing all the activities onboard. Now we can target a message that is specific to our guests. “If you cruised with us previously, we have a lot of information, including knowing what you purchased on an earlier cruise, and we make sure that our messages are relevant. We have come a long way so that the messages aren’t just from one department, they criss-cross between several different departments, not just retail, and it all flows together. 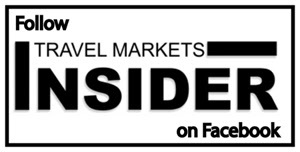 As a travel retail operator, Dufry has been able to collect quantitative information from around the world, giving the company the opportunity to extract information by nationalities, age, and other categories, says Riedi. From a qualitative perspective, Dufry conducts 10,000 in-depth interviews twice a year across all the channels in which it operates, to discover why people do or do not buy. From another point of view, Dufry is able to track exactly who is buying what in its stores, even how people browse the stores. “This altogether gives us an enormous amount of data that we can use for planning purposes,” said Riedi. Starboard uses analytics in several ways, says Goncalves. “On one side it supports the supply chain, inventories, and other core operational considerations, making sure that we are getting the right product on the right ship for the right guest at the right time. We clearly use sales performance analytics that are readily available for interpretation across a wide variety of levels. We are actually in the process of evaluating and standardizing this across the board, taking what we are already doing to the next level. Picking up on Heubel’s comment, Pittaway added: “We know who is traveling, we know where they are going and we know where they are coming from, and I think this will lead to a trend from broadcasting to narrow-casting. The experience of the passenger will be tailored to them. We won’t need to be sending out blanket announcements but instead each passenger will have something that will let us contact them about the things they are interested in. I think this will really evolve over the next few years. Remember, we have 100% captive business – and we can make the experience totally relevant for each passenger. A final discussion about the advent of pre- and post-cruise online ordering delivered a variety of responses from the panelists, with no clear agreement and some of them seeing challenges and advantages with one or the other. “Pre-cruise ordering is an opportunity that we haven’t fully tapped,” admitted Starboard’s Goncalves. “It would be a way to extend awareness of what is available onboard and emphasize the value of the Starboard product guarantee,” he concluded.